All residents in the Department of Anesthesia have the opportunity to participate in a variety of global health research, education and policy initiatives both internationally as well as domestically. All residents in the Department of Anesthesia and Perioperative Care have the opportunity to participate in a variety of global health educational opportunities. 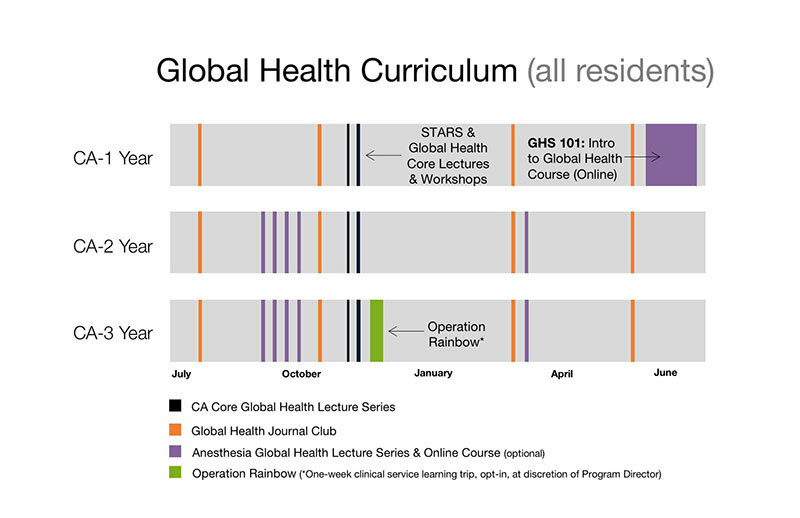 Residents in the clinical anesthesia years receive global health didactics as part of their core curriculum with the option to participate in an comprehensive global health equity curriculum designed for anesthesia trainees. All eligible residents are also given the option to during CA3 year to participate in a global health activity (Operation Rainbow). For anesthesia residents seeking additional global health training, mentorship and elective time, we offer a dedicated Global Health Pathway as part of the multidisciplinary, campus-wide Clinical Program. This pathway requires completion of the Global Health Sciences (GHS) 101 course during CA-1 year and the GHS 211 course during three weeks of non-clinical global health time during the CA-2 year. 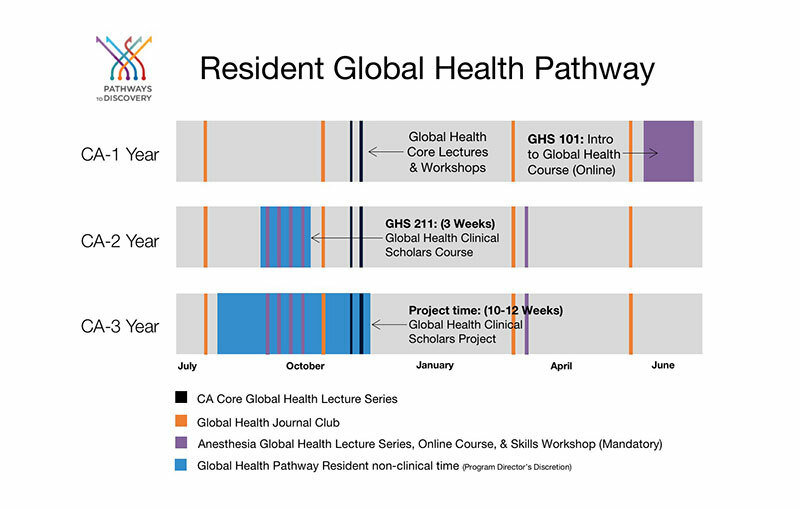 Global Health Pathway Residents also receive up to three months during CA-3 year to participate in global health education, research and policy projects both domestically and internationally. To read more about past and ongoing resident global health projects, click here. Residents during their CA-3 year are provided an opportunity to accompany UCSF faculty in Central and South America to participate in 1-week clinical service trips. These opportunities take place through a long-term partnership between the Department of Anesthesia & Perioperative Care and the non-profit Operation Rainbow. Residents work closely with attendings to provide preop, intraop and postop care for a wide range of surgical conditions in resource-limited practice settings. In addition to clinical teaching provided during the trip, residents are provided the opportunity to participate in a hands-on, pre-trip curriculum to develop clinical skills and familiarity with cultural and ethical issues relevant to the practice of anesthesia in resource-limited settings. Below are links to the growing number of funding opportunities for trainees interested in global health and anesthesia.